Tuesday April 17 was the due date for 2017 federal income tax returns – your deadline for tallying up how much of the money that you worked hard to earn all year goes to Uncle Sam to fund all sorts of important and worthwhile projects … like supporting the families of terrorist murderers. U.S. economic aid to the Palestinian Authority – paid for by your tax dollars – averages $400 million a year. 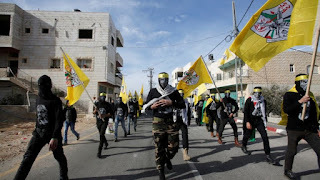 The Palestinian Authority’s 2018 budget includes approximately $360 million to support imprisoned terrorists and the families of dead terrorists – including murderers of Israelis and Americans. These payments make about as much sense as having American taxpayers send monthly support checks to the families of the Sept. 11, 2001 terrorists or the family of the Las Vegas gunman who murdered 58 people last year. The U.S. funds do not go directly to the Palestinian terrorists and their families. But your tax dollars pay for other projects that enable the Palestinian Authority to divert $360 million for its terrorist support program. The average Palestinian makes about $300 a month. A Palestinian terrorist in prison is paid between $368 a month for those sentenced to less than three years, rising to $3,400 month for those serving at least 30 years and for the families of dead terrorists. One has to question a culture that makes it more profitable for its people, including its youth, to die while killing civilians than to live. Some would call that philosophy self-inflicted genocide. In recent years, the Palestinian Authority hid its line item budget for terrorist payments. This year, however, when faced with the possibility of U.S. congressional action to withhold aid, Palestinian Authority President Mahmoud Abbas not only placed it openly in the 2018 budget – he defiantly thumbed his nose in the face of the American taxpayer. Abbas stated in January: "There is something that the Americans are telling us to stop – the salaries of the martyrs and the martyrs' families. Of course we categorically reject this. We will not under any circumstances allow anyone to harm the families of prisoners, the wounded, and the martyrs. They are our children and they are our families. They honor us, and we will continue to pay them before the living." President Trump signed the Taylor Force Act into law March 23. It is named after a U.S. citizen killed by a Palestinian terrorist during a March 2016 attack in Jaffa. Taylor Force was a former U.S. Army officer and West Point graduate who had served honorably in Afghanistan and Iraq, heroically risking his life in defense of America. The Taylor Force Act directs the State Department to certify that the Palestinian Authority has ceased payments to terrorists and their families and to report to Congress any violations. Congress is then legally required to withhold funds until the egregious violations are corrected.